Jim and I had a lovely, but short visit with our sister and her family in Santa Clarita, having dinner and spending the night with them before departing the next morning. We were due in Mission Viejo later in the afternoon, but first I had planned an outing to Los Pinetos Peak, the westernmost named summit in the San Gabriel Mountains north of Los Angeles. I had noted the peak a few months earlier when I was visiting the LPC summit of May BM a few miles to the east. At that time I had declined to make the longer trek between the two, figuring I could make a future outing of it to tag Los Pinetos and another, nearby unnamed summit at the same time. 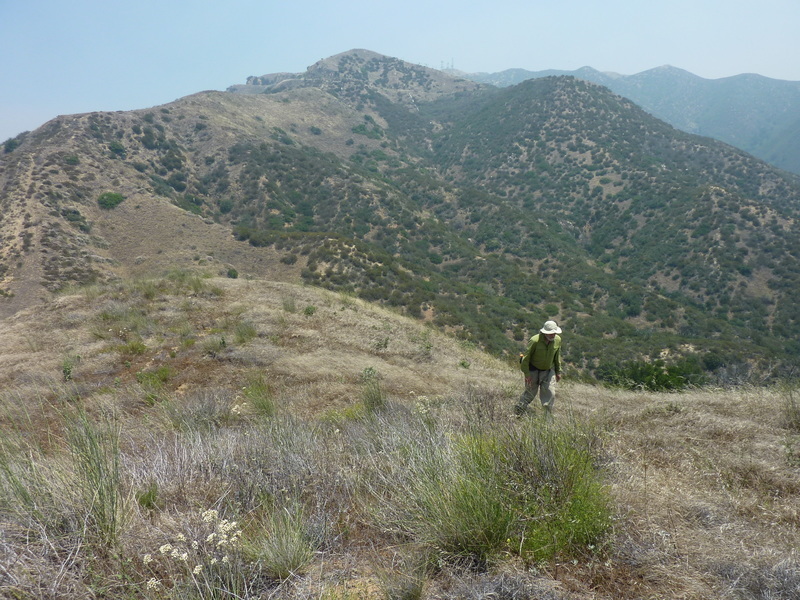 We started from Whitney Canyon Park, just east of the intersection of Newhall Ave and the 14 freeway. I had told Jim ahead of time that it would be about 8-9mi, but it turned out to be more like 11mi before we were done. He'd been having trouble with heel blisters and was worried his feet might not survive, but with a bit of moleskin and duct tape he was able to power through it all in good fashion. We spent almost 2hrs climbing the Santa Clara Truck Trail for about 5mi from the TH to the summit of Los Pinetos. This section of road is no longer open to motor vehicles, but it is used by both hikers and mountain bikers. We came across a bike chain in the road at one point, wondering how it got lost or left here - it seems like an integral part of a bike that would be sorely missed by someone riding it. The road climbs up through some rugged sandstone terrain, mostly covered in chaparral. Almost from the start we noticed that views were hazy and they only deteriorated as we climbed higher and the day wore on. The haze was due to smoke from the Sherpa Fire burning in Santa Barbara. Combined with temps in the high 80s, it made for some tough, not altogether safe, hiking conditions. The summit of Los Pinetos is crowned by a communications complex ringed with a sturdy perimiter fence. While Jim took shelter in the shade of a building, I walked the perimeter to make sure I'd reached the highpoint before joining him for a short break. I found some odd ceramic trinkets left as offerings near one corner of the fence, near an LADWP survey marker, one of several around the fenceline. After our break, we continued our looping route, now heading southwest along the connecting ridgeline to Peak 3,119ft. Though signed at a trail junction, the route along this ridge is far less used, showing mostly deer tracks and somewhat overgrown. The summit of Peak 3,119ft is found on a spur off the route, requiring some modest bushwhacking for about 1/4mi to reach the top. The summit would normally make a fine overlook of Sylmar and the San Fernando Valley to the south, but today we could just barely make out the 210 freeway below through the haze. We found a weathered geocache left under a bush at the top, the contents having suffered wet/dry cycles due to a leaking plastic container. Back on the trail we continued west, dropping in elevation and eventually picking up a better trail that took us down to the Elsmere Canyon Motorway, a dirt powerline rd running north-south over the edge of the range. We stopped at the road to let Jim re-engineer his heel bandages. He'd run out of duct tape and was needing to rearrange the existing pieces to adhere to his feet better.